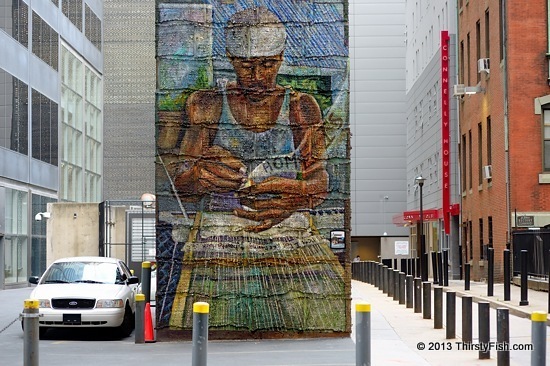 This is another view of the "Finding Home" mural on the Mural Mile. Since the last decades of the 20th century, homelessness is increasing among women. "Between 3.1 and 4.4% of homeless women in the United States are veterans of the armed services. Domestic violence is the direct cause of homelessness for over half of all homeless women in the United States. Approximately three quarters of the women who attempt to avail of domestic violence shelter beds are turned away in major American cities". About a quarter of all women experience domestic violence in the United States. While some of us are mindlessly "spending money we don't have, on things we don't need, to create impressions that won't last, on people we don't care about", many of us are finding ourselves homeless. The author of the above quote, Tim Jackson, argues in a TED Talk that we are being "persuaded" to buy stuff. He makes a compelling argument about why we need to help those who are less fortunate than us.